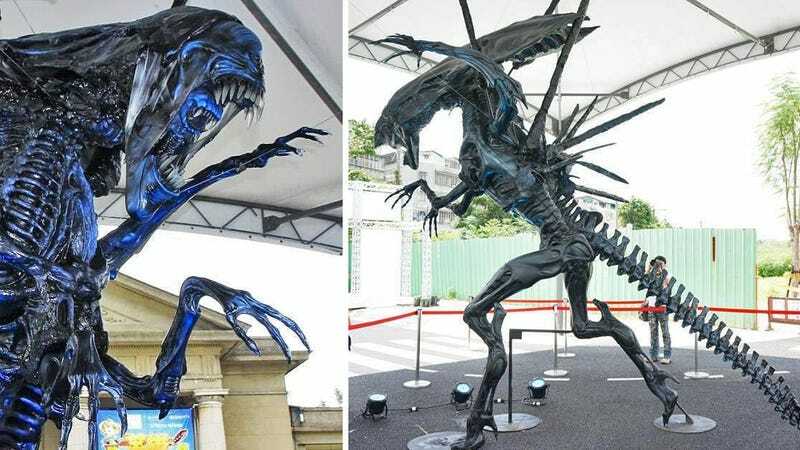 If your neighborhood has a home owner’s association that tirelessly works to ensure everybody’s lawn is neat and presentable, you might find yourself dealing with a few angry letters when you install this 16-foot tall replica of an Alien Queen in your front garden. But it’s still more tasteful than a ceramic gnome or jockey. Originally made sometime in the ‘90s by the prop builders at Distortions Unlimited, this Alien Queen replica was one of five created to be used for promotions, but is now the last one left in near perfect condition thanks to a recent restoration and paint job. The head, which itself measures almost eight feel long, has been updated to look screen-accurate to the Alien Queen that Ripley fought, and it even comes with replacement teeth just in case one gets damaged in transport, or gets broken off when someone tries to stick their head inside the replica’s mouth in order to snap a memorable selfie. Surprisingly, there’s free shipping if you happen to win this eBay auction, which seems like a bargain until you realize you’ll have to cough up at least $75,000 to claim your queen, assuming this post doesn’t start a bidding war. "That's it, man. Game over, man. Game over!"